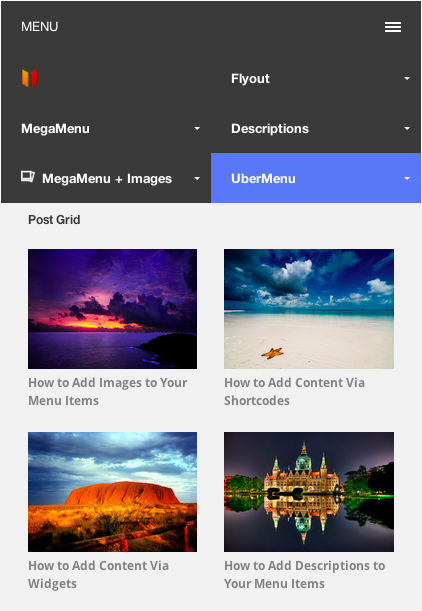 One of the really flexible pieces of UberMenu – Responsive WordPress Mega Menu Plugin is the Content Overrides system, which allows users to insert any type of shortcode content into their menu. 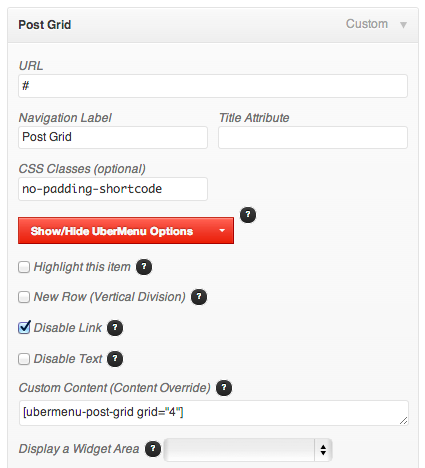 UberMenu ships with a variety of included shortcodes, but any shortcode can be placed in the menu. This leaves customers with the ability to write their own custom shortcodes as an easy way to add totally custom content to the menu. First, we tell WordPress that there’s a new shortcode it should be on the lookout for, and we tell it what function to run when it encounters the shortcode. This means that when WordPress sees this shortcode: [ubermenu-post-grid] it will execute the ubermenu_post_grid() function and print the returned value. We will add both of these pieces of PHP to our theme’s functions.php, preferably in a child theme in order to best preserve our customizations. The rest of the attribute values will then be applied as defaults. The extract() function turns each of the array keys into a variable, so now we have variables like $num, $grid, and $img that we can work with in our function. Next, we want to retrieve the matching posts from the database. To do this, we will set up an array of query arguments and pass them to the get_posts() function. We will also test the category value so that users can pass either a numeric or text value and still have the shortcode work. Now that we have retrieved the appropriate post data from the database, we need build our HTML. We’re going to loop through the array of posts the get_posts() function returned and create an unordered list of our posts, each with a link wrapping the post’s featured image and title. We’ll utilize UberMenu’s image generator function (which will use the same settings as the other images in your menu and can be set in the Control Panel) to make things easy. At this point, we have our markup, but it’s not styled, and it doesn’t look too pretty. Our final goal is to create a simple, flexible and responsive grid system for our menu items. First, we’re going to use `border-box` box sizing to make things easy. Finally, we’ll add a special class to adjust the normal submenu item padding in order to properly space out our grid evenly. The special classes no-padding-shortcode and no-padding-widget will be added to second level menu items to remove the padding and allow the grid to be laid out appropriately. Finally, we’ll make the grid responsive by implementing two breakpoints. Below 767px, we’ll collapse all grids to two columns, and below 480px we’ll collapse it further to a single column. We’ve now completed our two-part process: (1) create a shortcode in PHP, (2) style the shortcode output with CSS. I’ve provided final versions of the code as gists, which can be downloaded from github. 1. Add the shortcode PHP to your theme’s functions.php, preferably in a child theme in order make preserving your changes as straightforward as possible. Finally, actually create your menu item. 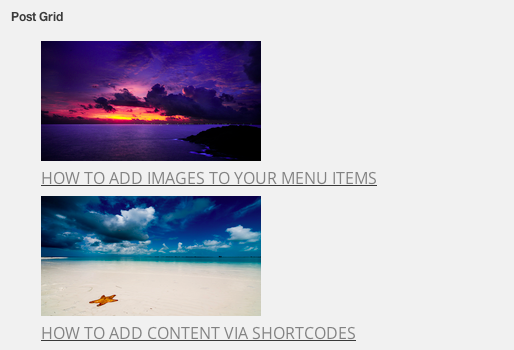 Add a second level menu item, and add a content override using your newly created shortcode! Then add the special class to your menu item, no-padding-shortcode (if you’re using a widget, use no-padding-widget) to ensure your grid aligns properly. Enjoy your new post grid layout! This entry was posted in WordPress Tutorials and tagged custom, shortcode, ubermenu, WordPress. Bookmark the permalink. Any idea how to activate that field? Shortcodes only. Executing PHP introduces unnecessary security risks so I’ve deliberately excluded that. Wrapping any custom PHP in a shortcode is simple and more maintainable. I’m trying to display the excerpt – I’ve changed it to on in the functions but its still not showing? I am unable to style the output. I tried putting the css in style.css with !important, in custom.css, and within the plugin area. All results are the same; I get the featured images without any styling. Also, is there a way to order the output by title (alphabetically)? Hi is UberMenu 3 out yet? is this UberMenu Responsive Mega Menu?? The UberMenu 3 release candidate is currently available to customers in the support forum. The official release should be in the next couple of weeks. Yes, this is UberMenu. thirteen twenty theme. Added css code to style.css. Step 2. I am not able to see “Post Grid” Menu template like in your example. Can you please help to understand why ? The code is specific to UberMenu 2. The functionality is built in to UberMenu 3, so you don’t need this for UberMenu 3. Please post any further questions in the Support Forum – thanks! Sorry, I thought it was UberMenu 3. Now I am totally confused. The problem for me now is to separate Beta 3 topic from Version 2.